Netflix’s algorithms have noted how much time you’ve spent with the Whites of Albuquerque and the Escobar cartel. They may also be observing your fruitless searches for the Crowder gang within the service’s streaming library, because Ozark—despite being created by The Accountant duo of Bill Dubuque and Mark Williams—plays like a computer program’s idealized hybrid of Breaking Bad, Narcos, and Justified. There’s a seemingly milquetoast guy and his wife doing the legwork for an intimidating drug boss, all of which is complicated by their dealings with artful backwoods criminals and the FBI agents attempting to get to the drug boss. The show is also unrelentingly dour, which you could chalk up to the humorlessness of 1s and 0s, or more accurately pin to showrunner Chris Mundy, who, when he was in charge of AMC’s Low Winter Sun, took a dirty-cop drama set in a scuzzy corner of the U.K. underworld and managed to make it grayer and drearier. Ozark sticks to the prescribed paths of more esteemed TV heavyweights, which is doubly frustrating, because the Netflix drama occasionally threatens to stray from those paths and buck narrative convention. At the beginning of the show, Marty Byrd (Jason Bateman) has already broken bad; the Skyler to his Walt, Wendy (Laura Linney), has already fucked Ted. And by the end of the second episode, eldest Byrd child Charlotte (Sofia Hublitz) and her kid sibling, Jonah (Skylar Gaertner), have learned why the family fled to the Lake Of The Ozarks with three conspicuously large suitcases tucked under their motel bed. Dad’s a money launderer trying to work off his debt and prove his worth to kingpin Camino Del Rio (Esai Morales), a scheme that involves moving his operation from Chicago—where the competition is fierce and the eyes of the law are everywhere—to a seemingly untapped market with thousands of miles of shoreline wending through the Ozark Mountains. 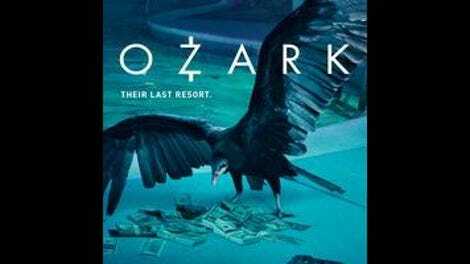 It’s refreshing to see Ozark conduct its business so openly, not depending on the stringing along of various Byrds for dramatic effect. 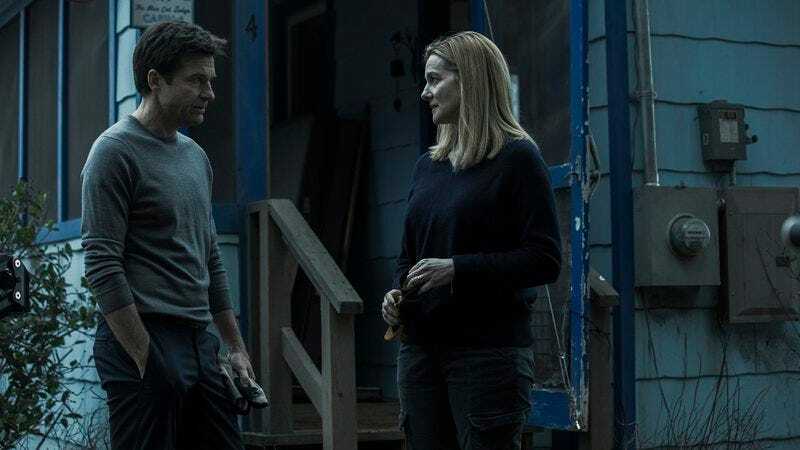 The audience isn’t so lucky: Ozark’s ability to compress does not extend to its early passages, which take an eternity to arrive in the eponymous setting, languishing on the circumstances from which the Byrds take flight. They’re miserable in Chicago, and then they’re miserable in the mid-century A-frame lake house they buy from (and subsequently share with) cantankerous, dying Buddy (Harris Yulin)—a mood shared by the show’s oppressively blue color palette. Even the source of the show’s one good joke is grounded in misery: Sleep-deprived Marty hallucinates that he’s being dressed down by a televised image of Sarah McLachlan, in a parody of the musician’s tear-jerking American Society For The Prevention Of Cruelty To Animals PSAs. The malaise makes these anti-protagonists seem so much flatter than their new business associates and neighbors, like Ruth Langmore (Julia Garner), de facto matriarch to a family of delinquents who strikes up a fraught connection to Marty. Whenever Garner flashes the piercing stare and wounded, sideways glance she’s been perfecting in small batches on The Americans, there’s a suggestion that while you can’t take the Ozark out of the show, you could take the Byrds out of the Ozark. Ozark’s main characters would tip over in a stiff breeze, but they’re taking root in a setting worth exploring, a rural resort town where there’s all sorts of story to be spun from the relationship between out-of-towners and year-round residents, where those who’ve been there the longest speak portentously of vain attempts to “tame” the region. On top of the pot-boiling crime stuff, Ozark is a fish-out-of-water, haves-and-have-nots story, and once the ecosystem of the man-made lake they call the Magic Dragon is established, there’s a little more call to wade into the next episode—and the marks of a production that’s thinking beyond the Byrds’ front door. There’s a failing waterside lodge run by Rachel Garrison (Jordana Spiro, who can do so much better) and the local preacher (Michael Mosley, right at home in this state of earnestness) who delivers Sunday service from a boat. Marty’s naïve enough to think that his would be the only criminal enterprise tucked into the Ozark foothills, never pausing to realize that there are desperate people everywhere, and they’re just as good at covering their tracks as Marty Byrd. Netflix is trotting out a Jason Bateman-Laura Linney show where the least interesting parts are Jason Bateman and Laura Linney. The gradual reveal of all the shady dealings along the lake increasingly diminishes the heads of the Byrd household. They are who they are from the middle of the season premiere on, and though there’s a novelty to that, the A-listers wind up playing static figures while the supporting players keep showing off new shades. They’re the shades you’ll find in a lot of other crime dramas’ crayon boxes—the intellectual ne’er-do-well, the closeted crook, Jesse Pinkman—but those are better than all the frosty tints cast on (and by) the Byrds. Marty and Wendy don’t give Bateman and Linney much cause to stretch. One gets saddled with some sub-Scorsese soliloquies about criminal philosophy; the other has to make subtext into text with lines about vultures circling the Byrds’ and the scrubbing of a damned spot on the family’s dock. Some of the same skills that serve Bateman’s comedic work—the stone-faced reactions from Arrested Development and Horrible Bosses, the foxlike slyness of a literal fox from Zootopia—get worked out here, but there’s not enough cause for him to escape a certain Bateman-ness. You can put the actor in a role where he’s covering for a sticky-fingered partner (not pard’ner) and not invite snarky comparisons to the Bluths. But when Marty winds up on a bicycle, all you can see is Michael Bluth towing a TV on two wheels. For Marty, Wendy, Ruth, and others, there’s no escaping the past; the same goes for a show as derivative and lethargic as Ozark.